We have seen a recent surge of books highlighting the achievements of great women throughout history. These books aim to redress historical imbalances and inspire children of all genders to recognise the potential within themselves and in those around them. 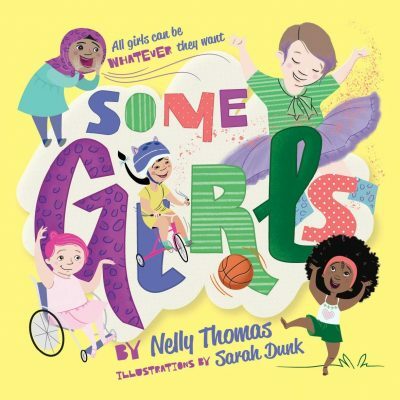 Comedian Nelly Thomas’ first picture book, Some Girls, is entirely on trend, yet it provides a fresh angle by validating the individuality and choices of young girls themselves. After countless years of absorbing the same, old cultural narratives dictating how people should behave based on gender, it is refreshing to have such a straightforward and accessible affirmation of difference—communicating that it’s okay for girls to express themselves however they like and that girls can have various (and sometimes conflicting) interests and demeanours. The energetic writing matches the bright (and inclusive) illustrations by Sarah Dunk. The text repeats the pattern that some girls are this way, and some are that, but all girls can choose for themselves. This book will only improve when its companion, Some Boys, is published later in the year. Both books belong in every home and school as reminder to children at any age that they are valid, as are those around them. Michael Earp is a children’s bookseller at The Little Bookroom.